Who is your birth Lord? : Francis Irving Who is your birth Lord? OK, your mission for today, should you choose to accept it, is to find out who your birth Lord is. This is a special mission. My birth Lord is Richard Rogers of Riverside (biography, Parliamentary record). He was born on the same day at the end of July as me. 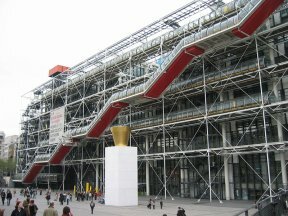 He’s a famous architect, responsible for the Pompidou Centre (picture right). More recently his career has flopped, as he designed the Millennium Dome! He’s in the Labour party, doesn’t vote much, and has once or twice rebelled on Terrorism. He sticks to his special skills when talking in Parliament, always on subjects like planning and urban renewal. I’ve written him a polite letter to find out his views on the Legislative and Regulatory Reform Bill. Go immediately to WriteToThem.com’s new Lords edition. Where it says “birthday” enter your birthday. You will be told which members of the House of Lords have the same birthday as you. Clearly, they must be the ones that represent you in Parliament! Click on “Find out more about Lord … (new window) on TheyWorkForYou.com.” to learn more about your birth Lord. If you have more than one birth Lord, you’ll need to click on their name first. See what party they are, scroll down to read their speeches. Click the link in the right sidebar to read their Wikipedia biography. Blog about your birth Lord, you can pinch the format I used above. Ask five of your blogging friends to in turn find and post about their birth Lords. Bonus points: Write a letter introducing yourself to your Lord. At least make sure you don’t forget your birthday, so next time you need to write a Lord you know who to write to! Sit back, relax, and enjoy that new found glow of democratic accountability all day.